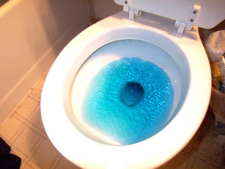 I don’t know why you would want to do this, but it seemed funny enough to me that I thought I’d point you towards a guide on how to turn your urine blue. We’ve all dreamed of it – who wouldn’t want to have bright blue urine? Alright, I admit some people might be appalled at this strange activity, but many will find it interesting. My interest in this subject began from hearing a rumor that there was a chemical you could add to food that would make someone’s urine turn blue, as a prank. The person I heard it from had no idea what chemical it was but insisted that it existed. I, of course, being of the Google generation, searched immediately for turn urine blue and lo and behold, the second result was a Wikipedia entry for a chemical called Methylene Blue. I knew I had to have it.